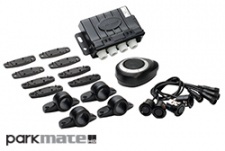 Parkmate sensors are the next best thing to a personal valet. Employing the latest in object sensing technology, Parkmate sensors are developed & manufactured by world leading sensor manufacturers. Parkmate sensors help you not only to park your vehicle, but also prevent accidents and potentially disastrous incidents with other objects and even people. During parking, systems employ Parkmate sensors to detect nearby objects that might not be in your field of view and enlist audible signals and illuminated displays to help you park. When your car’s proximity is too close to an object in the detection zone, an audible alarm sounds which increases in intensity in proportion to your distance from the object, simultaneously displaying the direction and distance. 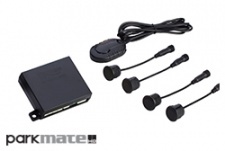 Parkmate’s PTS410V4 features four reverse digital sensors with audible alerts and an LCD Display that enables you to distinguish exactly how far away you are from an object when reversing or parking your vehicle. The PTS410V4 system gives you the confidence to know that you’ll be alerted when obstacles and danger is detected. 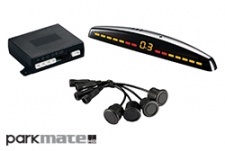 Reversing and parking your vehicle has never come more naturally than with Parkmate's PTS410M7 – Digital 4 Sensor Rear Parking Assist System with LED Display & Audible Alerts. When are obstacles detected by the rear sensors while reversing, distinct alerts will be sounded in conjunction with an illuminated LED display to safeguard you and your family from any unfortunate incidents. The rugged design of Parkmate’s PTS410W1 makes it the perfect reverse parking assist system for your commercial vehicle or pickup truck. Featuring a wireless connection between sensors and buzzer, intelligent moving object detection and anti-false alert technology the PTS410W1 is the essential reversing digtial sensor system for any commercial vehicle. The PTS400M5 features a rear sensor system with slim dual colour LED display. The PTS400M7-F features a front sensor system with slim line dual colour display with automatic radio mute. The PTSV404 features a Rear Parking Assist System with Monitor & High Definition Camera. The PTSV400 features a Rear Parking Assist System with Video Output. The PTS400 features a Rear Parking Assist System with Buzzer. The PTS800V3 features a Front & Rear Parking Assist System With AWS Technology. The PTS800V2 Front & Rear Parking Assist System With LCD Display. The PTS800MM features a Front & Rear Parking system with Ultra-Slim LED Display. The PTS400V1 features a Rear Parking Assist System with Dynamic Blue LCD Display. The PTS400V5 features a Rear Parking Assist System with Blue Display.